More news just in from International Yacht Collection as Jon Motta signs Broward's 33.32m megayacht Trevia for sale. An all-aluminium build launched in 1999, the megayacht sleeps up to eight guests in four staterooms and has a cruising speed of 18 knots with a range of 4,750 nautical miles at 10 knots. 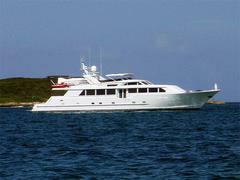 New engines and generators were installed in 2007 and she's now on the market asking $3.695 million.